27/08/11 am: Little Egret flying east along shore. Fulmar on cliffs. Flock of 190-200 Oystercatchers on beach at Fairlight Cove. I have been recording numbers of bumblebees on timed walks at Hastings Country Park this summer, comparing numbers to Dungeness. Not surprisingly, given the different habitat, the responses of bumblebees to the spring drought have been totally different. For instance whilst at Dungeness the red tailed bumblebee Bombus lapidarius has been unusually scarce this summer at Hastings it has been abundant. Back in May both species were equally common on timed walks in pasture managed for bumblebees, however by this month there were three times as many females of this species at Hastings. Males (sporting an additional yellow band at the front of the thorax) can be seen at both sites now. Nikki Gammans from the Bumblebee Conservation Trust ran a very successful bumblebee walk at Hastings Country Park Nature Reserve on Saturday, organised by the Friends of Hastings Country Park Nature Reserve. It was well attended and everyone thoroughly enjoyed the event and went away with new skills in bumblebee identification and learnt a lot about the bumblebee management at the nature reserve. Nikki highly praised the work we have already carried out at the nature reserve in creating large areas of bumblebee habitat. More information on Wild Hastings. Interested in being a Friend of Hastings Country Park Nature Reserve? Check out their website for details on joining. 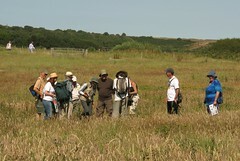 The Friends of Hastings Country Park Nature Reserve was formed in April 2007 by members of the Volunteer Rangers, as a means of involving the wider community in the management and enjoyment of the Reserve. Our aim is to protect, promote and enhance the natural environment of the Reserve, and to encourage others to join us in this work, so that the value of the Reserve and its wildlife is protected for future generations. To fulfill this objective, we will continue to support the conservation work set out in the management plan, assist in monitoring wildlife, and raise funds for projects within the Reserve that might not otherwise be possible. To help visitors enjoy the Reserve to the full, we organise a programme of events throughout the year, and aim to enhance and assist with running the Visitor Centre. At 07.30, I was up at the Firehills too late again. Even as I was getting out of the car I could see dense lines of Woodpigeons, comprising several hundred birds, moving along the cliffline while another couple of hundred were sweeping over the car park on whistling wings. Back on the Bernard Ince memorial bench, squinting into the bright sunshine as flocks arrive straight off the sea, out of the sun above the luminous ripple of the Pas de Calais. I can’t see them till they’re right on top of me and once was first alerted by shadows flicking across my notebook page. 47 sp in 2 hours in TQ81K ie Quarry, Warren Glen, Lovers’ Seat, Fairlight Glen, Place Farm. Calls of small finches coming from the sky but very hard to see the birds, so numbers uncertain, at least 45 Redpolls however. Crossbill and Brambling heard only. Skylarks moving steadily west: 59 altogether. 5 Chiffchaffs, 1 Blackcap, 8 Goldcrests, 2 Firecrests. Novelty value was provided by a late HONEY BUZZARD pursued low W across the fields by a couple of crows. About 10 people came to Lime Kiln Cottage yesterday morning to watch Chris open up the moth trap, to start the RX Wildlife Festival. The less common species included White-point, Yellow Belle, Mullein Wave, Light Brocade and Shears, plus several spectacular Cream-spot Tigers and the Eyed Hawkmoth shown below on the girl’s sleeve. In the evening Andy Phillips ran two MV lights in the Hastings Country Park Quarry, with again about 10 people gathered to see what was about. Among the moths attracted were Cream-spot Tiger, Rivulet, Clouded Silver, Brown Silver-lines, Waved Umber and both Angle Shades and Small Angle Shades – all in little more than an hour of darkness. An adult female red-footed falcon flew east over Warren Glen, Hastings Country Park Nature Reserve early afternoon today. It flew in low over Warren Glen before gaining height and drifting east. Less visible migration today with only 130 goldfinch east and smaller numbers of meadow pipit and siskin. Grounded migrants reported included 16 redpoll, 3 wheatear, 11 stonechat, 2 reed bunting, 9 yellow wagtail and 2 tree pipit. Two common buzzard were seen hunting along field margins and hedgerows. Reported by Andrew Grace with more information on wildhastings.